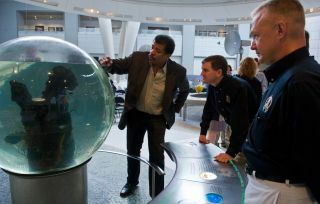 Dr. Neil deGrasse Tyson, left, shows off a snail habitat to STS-135 astronauts Rex Walheim, center, and Doug Hurley prior to a presentation by the crew at the American Museum of Natural History, Tuesday, Aug. 16, 2011, in New York City. Astrophysicist Neil deGrasse Tyson joined the ranks of the Twitter elite when he reached 1 million followers on Sunday (Feb. 3). The director of the Hayden Planetarium run by the American Museum of Natural History in New York City commemorated the occasion with a special tweet to his newest follower. "Welcome @halfsail as my millionth Twitter follower," Neil deGrasse Tyson wrote in a twitter post from his handle, @neiltyson. "FYI: I tweet mostly random, occasionally coherent, cosmic brain droppings." Tyson is known for his somewhat irreverent tweets about space and science. "In 5-billion yrs the Sun will expand & engulf our orbit as the charred ember that was once Earth vaporizes," Tyson wrote on Jan. 24. "Have a nice day." He even had a conversation with a popular anthropomorphized tweeter, the Mars Rover Curiosity. "Dear @MarsCuriosity, Neil deGrasse Tyson here on Earth, tweeting you, via a wormhole, through deep space. Do you copy?" Tyson wrote after Curiosity landed safely on Mars. In 2014, Tyson will host a reboot of the famed TV show "Cosmos," originally hosted by astronomer and writer Carl Sagan. The original program focused on exploring broad scientific ideas like the origin of life, and humanity's place in a vast universe. Tyson is no stranger to television. He hosted five seasons of the educational science show "NOVA scienceNOW" on PBS, and he often makes guest appearances on news and commentary programs like "The Daily Show" and "Real Time with Bill Maher." Although Tyson might be the latest space-obsessed tweeter to garner 1 million followers, he isn't the first. Veteran spaceflyer Michael Massimino (@Astro_Mike) not only surpassed 1 million followers, he was also the first NASA astronaut to tweet from space. Follow Miriam Kramer on Twitter @mirikramer or SPACE.com @Spacedotcom. We're also on Facebook & Google+.